DATA NETWORKS 48 E&MJ • NOVEMBER 2017 www.e-mj.com trol another 280 t/d. Mill uptime improve- ments were anticipated to add another 2.8 hours of operation per month as well. Barrick also said its Goldrush under- ground project, scheduled for completion by the end of 2017, presents many op- portunities for automation of stationary equipment such as rail haulage, automat- ed chute delivery, engineered bin systems, automated hoisting, smart conveyors, au- ger feed systems and ore pass delivery as well as 'in motion' activities that include autonomous drilling and mucking. 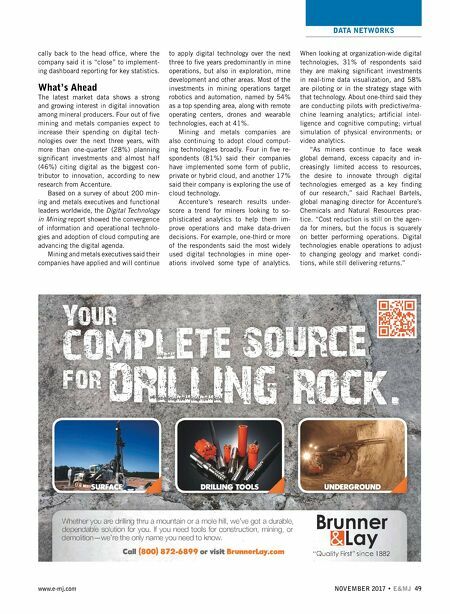 Ed Humphries, head of digital trans- formation at Barrick, recently provided some details of the digital initiative, as it pertains to the underground operations in Nevada, in the company's Beyond Borders blog. The Short Interval Control system at Cortez, he explained, "allows our people to see in real-time the locations and work status of different personnel and equip- ment which helps with planning. It helps us avoid sending equipment to a head- ing when it isn't ready or is already being worked. It has the ability to control work- flows and condition of equipment through apps, helping to increase efficiencies." 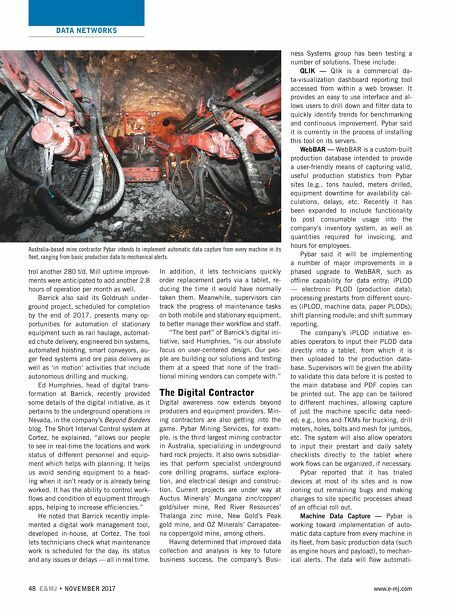 He noted that Barrick recently imple- mented a digital work management tool, developed in-house, at Cortez. The tool lets technicians check what maintenance work is scheduled for the day, its status and any issues or delays — all in real time. In addition, it lets technicians quickly order replacement parts via a tablet, re- ducing the time it would have normally taken them. Meanwhile, supervisors can track the progress of maintenance tasks on both mobile and stationary equipment, to better manage their workflow and staff. "The best part" of Barrick's digital ini- tiative, said Humphries, "is our absolute focus on user-centered design. Our peo- ple are building our solutions and testing them at a speed that none of the tradi- tional mining vendors can compete with." The Digital Contractor Digital awareness now extends beyond producers and equipment providers. Min- ing contractors are also getting into the game. Pybar Mining Services, for exam- ple, is the third largest mining contractor in Australia, specializing in underground hard rock projects. It also owns subsidiar- ies that perform specialist underground core drilling programs, surface explora- tion, and electrical design and construc- tion. Current projects are under way at Auctus Minerals' Mungana zinc/copper/ gold/silver mine, Red River Resources' Thalanga zinc mine, New Gold's Peak gold mine, and OZ Minerals' Carrapatee- na copper/gold mine, among others. Having determined that improved data collection and analysis is key to future business success, the company's Busi- ness Systems group has been testing a number of solutions. These include: Qlik is a commercial da- ta-visualization dashboard reporting tool accessed from within a web browser. It provides an easy to use interface and al- lows users to drill down and filter data to quickly identify trends for benchmarking and continuous improvement. Pybar said it is currently in the process of installing this tool on its servers. WebBAR — WebBAR is a custom-built production database intended to provide a user-friendly means of capturing valid, useful production statistics from Pybar sites (e.g., tons hauled, meters drilled, equipment downtime for availability cal- culations, delays, etc. Recently it has been expanded to include functionality to post consumable usage into the company's inventory system, as well as quantities required for invoicing, and hours for employees. Pybar said it will be implementing a number of major improvements in a phased upgrade to WebBAR, such as offline capability for data entry; iPLOD — electronic PLOD (production data); processing prestarts from different sourc- es (iPLOD, machine data, paper PLODs); shift planning module; and shift summary reporting. The company's iPLOD initiative en- ables operators to input their PLOD data directly into a tablet, from which it is then uploaded to the production data- base. Supervisors will be given the ability to validate this data before it is posted to the main database and PDF copies can be printed out. The app can be tailored to different machines, allowing capture of just the machine specific data need- ed; e.g., tons and TKMs for trucking, drill meters, holes, bolts and mesh for jumbos, etc. The system will also allow operators to input their prestart and daily safety checklists directly to the tablet where work flows can be organized, if necessary. Pybar reported that it has trialed devices at most of its sites and is now ironing out remaining bugs and making changes to site specific processes ahead of an official roll out. Machine Data Capture — Pybar is working toward implementation of auto- matic data capture from every machine in its fleet, from basic production data (such as engine hours and payload), to mechan- ical alerts. The data will flow automati- Australia-based mine contractor Pybar intends to implement automatic data capture from every machine in its fleet, ranging from basic production data to mechanical alerts.